Scottscope: Mission Accomplished: The Pleasant Surprise That Is "The A-Team"
Mission Accomplished: The Pleasant Surprise That Is "The A-Team"
Upon seeing The A-Team on television as a young child, I was immediately hooked. That same summer my mother had taken me to see Rocky III, and just like every other kid my age I had become enamored with Mr. T. I had heard much about the show from my young friends before I had ever watched it. The advertisements made it seem like something aimed at adults. My early misconception could not be further from the truth. By the time the end credits rolled, my young mind was sold. The A-Team became a regular ritual for me during my 1st and 2nd grade years. I remember the teacher putting my name on the board because I was humming the theme song for the show shortly before the final bell rang. In Christmas of 1984, my father, who always had a keen awareness of what interested me as a child, bought me three A-Team action figures: Hannibal, B.A. and Murdock. Each came with an M-16, binoculars and other accessories. The A-Team property is one of my few childhood obsessions that did not stay with me throughout my adult years. Attempts to cash in on the nostalgia factor of the show have always been lost on me. 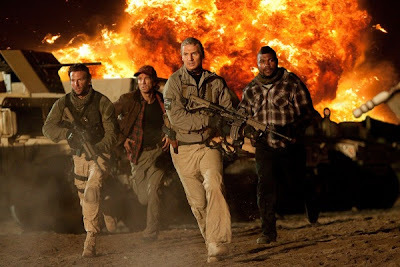 When it was announced that Joe Carnahan was heading up a big screen version of the franchise, I couldn't muster up much interest. I did harbor a tiny bit of curiosity as to what it would look like. 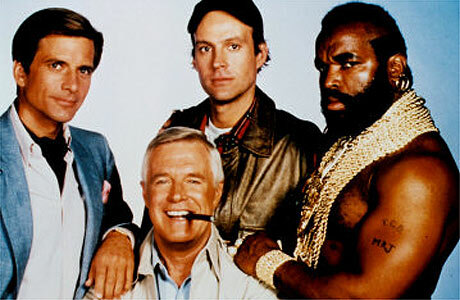 The A-Team was, from a visual standpoint, the consummate "80's Show". The wardrobe and catch phrases spouted by Mr. T could hardly work in today's world. When the first pieces of advertising surfaced, my curiosity was mildly peaked. The trailer seemed to capture the spirit of the show, but I still was not completely sold. Nor was I happy with some of the casting choices. My temporarily peaked curiosity soon fizzled to near indifference. The A-Team would not be one of my more anticipated summer releases. I saved my excitement for The Expendables, Inception and Predators. I dragged my feet when it came to finally seing the film. I opted for a matinee showing, figuring that's all it would be worth. 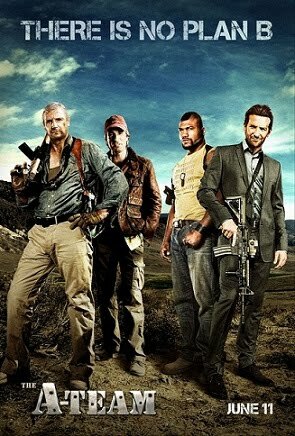 The A-Team chronicles the exploits of a quirky team of crack commandos. After their initial meeting, they pull of a number of successful missions during the Iraq war. When they are commissioned to perform black ops in Baghdad, the operation goes awry. They are subsequnetly arrested and sentenced to hard time in federal prison. The Mysterious CIA agent behind the failed mission offers them a shot at redemption that requires them to become fugitives until they can attain that which can clear their names. The first act of the film did nothing to assuage my fears. We are introduced to Colonel Hannibal Smith(Liam Neeson) by way of a torture/interrogation scene which features a wholly ridiculous and inexplicable means of escape. We are introduced to B.A. "Bad Attitude" Baracus (Quinton Jackson) with an ineptly choreographed fight scene. The camera jitters and jerks as if overdosed on 5 hour energy shots. The scuffle seems as though it's taking place in the middle of the earthquake. One of B.A's signature catchphrases is revealed in a way that would have been far better received had the entire sequence been the least bit competent. Of all the character intros. only "Howling Mad" Murdock's (Sharlto Copley) comes close to hitting the mark. The film is on such unsteady ground at this point that it seems unlikely that it will ever find it's footing. Thankfully it does, and once the actual story (disjointed as it is) gets rolling, The A-Team is a lot of fun. It ends up being a great deal better than the ads and trailers would have you believe. Much of this is due to Joe Carnahan's understanding of the source material. He clearly "gets" The A-Team. and makes sure that all of the signature elements of the show survive the translation to the big screen. The screenplay provides suitably outlandish plot developments and set pieces, and the principles channel the spirits of their small screen counterparts as though they were part of a cinematic seance. The A-Team also possesses something of a cinematic healing factor, recovering from it's botched opening steadily and smoothly. As the running time wears on, the set pieces become more coherent and establish a visual language that is understandable to the viewer. The film is like a severe introvert at a party that somehow finds his social niche during the course of the event and blossoms into a extrovert before our eyes. By the midway point I was invested much more than the opening act lead me to believe I would be. Aside from the horrible introduction, the film suffers from two other flaws that thankfully don't slow it's momentum much. The plot is more convoluted than necessary. It's a far cry from the "Fugitive" style serialized drama of the series where the team would use their skills to help those in need and then evaporate like dew in the early morning. The other major hurdle is the casting of UFC champion Quinton "Rampage" Jackson as B.A. Baracus. Though not "bad" per se, he is the only cast member that does not fully inhabit his character. It could just as well have been any hulking behemoth playing the part. Mr. T was not a great actor but he was a true original. Quinton hasn't an ounce of his charisma. That is really a shame, since the film cleverly uses B.A's fear of flying as a constant source of humor. The bits are entertaining, but could have been so much more had a better actor been cast in the role. 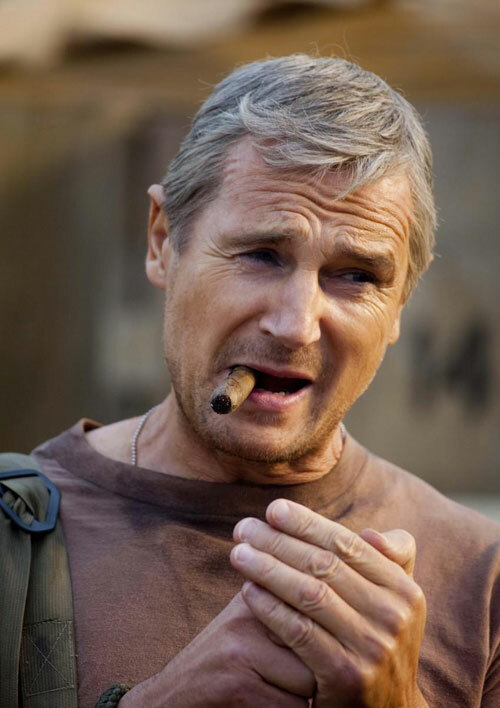 As Colonel Hannibal Smith., Liam Neeson truly embodies the character and almost makes us forget that his American accent doesn't quite work as well as it should. Bradley Cooper simply is Templeton "Faceman" Peck. Sharlto Copely inhabits the role of H.M "Howling Mad" Murdock so completely that it becomes downright chilling at times. You really can't imagine the original cast of the show doing a better job than their big screen counterparts. Brian Bloom has a lot of fun as the snarkily villainous mercenary Pike. While the self aware villain has become a huge cliche in recent years, Bloom beings real energy to it. He really does seem to be "ahead of the curve" so to speak, with his so called superiors struggling to keep up. As Charisa Sosa, Jessica Biel is the female counterpart to Quinton Jackson, offering nothing of real consequence to the proceedings. (Ten years ago / In 1972), a crack commando unit was sent to prison by a military court for a crime they didn't commit. These men promptly escaped from a maximum security stockade to the Los Angeles underground. Today, still wanted by the government, they survive as soldiers of fortune. If you have a problem, if no one else can help, and if you can find them, maybe you can hire... The A-Team.